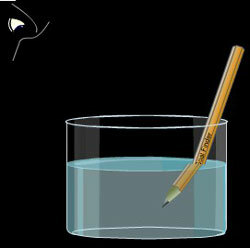 Educational science animation " Bent Pencil" : Why does a pencil dipped in water appear bent. Application of principle of refraction shown from different perspective make the understanding better. This animation gives explanation based on user perspective. This animated physics topic is very useful for teachers and students both. 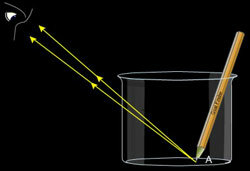 Principle of refraction works in the case of pencil appearing bent when dipped in water, to understand bent pencil from books is not easy , because, observers point of view is never shown . The animation shows different views to explain the concept clearly. A pencil which is partially dipped in water appears bent to the observer. Rays emanating from the portion of the pencil above water reaches the observer's eyes directly. While the light rays emanating from the submerged part of the pencil reach the observer's eyes after being bent at the water-air layer. The combination of the light rays reaching the observer give a look of the bent pencil. The bent pencil even appears fatter. Ans: What you have seen is our preview that contains only some scenes from the animation, you can see the full animation by purchasing a subscription at a highly discounted rate of $2 or by purchasing and downloading this product.